The festival of Janmashtami commemorates the birth of Lord Krishna. It is the occasion when everyone pampers this child god to come down to earth and shower their blessings. So thus to mark the advent of the Lord on this earth, every devotee makes that their house is fully adorned and neatly decorated so that little Krishna remain pleased with the whole ambience. So here is a collection of list of decorative items with which you can beautifully adorn your place render a sublime look. Janmashtami is the time to decorate. It’s the time when almost every Hindu household adorn their place so that Lord Krishna could visit their place and find solace and comfort. Thus in order to please the Lord, many popular traditional decorative items are used by adorn the house. Thus it is the apt time to decorate the house with flowers, the jhula (cradle of Lord Krishna) and many more. So beautify your house to celebrate the birth of Lord Krishna. Listed below are few of the traditional decorative items which can be used to decorate the house on the occasion of janmashtami. It’s Janmashtami, so decorating your house with Lord Krishna’s idols and sculptures are the most important decorative items. 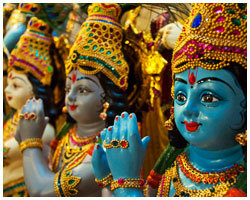 Devotees can worship this idols and offer pujas as well. They can also be placed in living room as a form of decoration, for placing them in your house can surely enhance the piousness of your house. 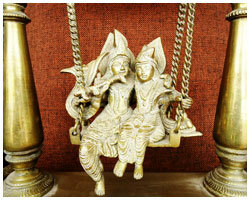 You can also opt for Wall Hangings of Lord Krishna as a form of decorative items. 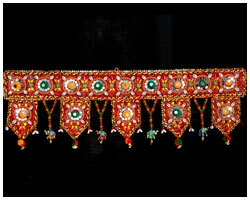 As the festival is traditionally celebrated, wall hangings with some ethnic touch are preferred over others. Embroidered cloth panels can also add a touch of wonders to your overall decorations. You can also make use of Lord Krishna’s pictures by pasting them over Door hangings. This will surely prove as an attractive form of decorative item to adorn your place as well will cast away every form of evils from your place. 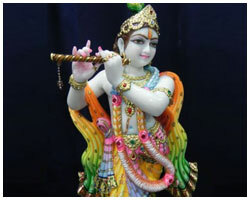 Moreover you can also customize attractive torans by stitching or pasting other popular Janmashtami symbols that of flute, morpankh (peacock feather), and pots containing butter and butter milk and many more. Adorning your place with these forms of items will surely to enhance the ethic beauty of your abode. 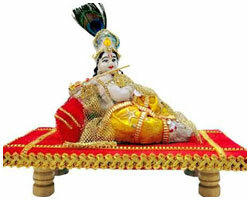 One of the most common and exquisite pose of Lord Krishna is that of the Lord playing flute and sitting on a chawki. Thus why not make use of some beautifully decorated chawkis on this auspicious occasion? You can simply make this chawkis back home and decorate them as per your own wishes. You can make use of some chunri print cloth to decorate the Chawki of Lord and give it a colourful look. Lord Krishna without the symbolic Jhula seems so incomplete. Thus it is almost customary to position the Lord over a swing. Thus arrange a beautiful swing and adorn it with fresh flowers and hangings so that it appears to become more appealing.